Bonet’s work has been exhibited nationally, internationally, and resides in the collections of the University Of Michigan Museum Of Art, The Museum of Contemporary Photography, the Southeast Museum of Photography, the Haggerty Museum of Art, University Club Chicago, and the JPMorgan Chase Art Collection. Her work has also been published in print and online nationally and internationally. Most recently, Bonet received recognition and support for her work from the Individual Artists Program Grant from the City of Chicago Department of Cultural Affairs & Special Events, in 2017. In 2016 she was selected as a Flash Forward Emerging Photographer by the Magenta Foundation, and in 2015 she was chosen as one of PDN’s 30 New and Emerging Photographers to Watch. When and where did City Space begin? City Space was created in response to my newfound urban landscape. Before moving to Chicago to attend grad school at Columbia College Chicago, I had lived in Florida. I was used to a lush tropical climate with a slower pace of life dominated by the automobile. The city, on the other hand, was opposite to what I was accustomed. I started making images as a way of understanding and exploring this foreign landscape and my place within it. The project started to take form in 2011/2012, during my last year of grad school, and I’ve been working on the project ever since. As my relationship to the city shifts and changes over time, so does my interest in the people, the physical space, and its structure. Every year, it seems, I become obsessed with an idea that wholly consumes me. One year, it was traces and mark-making, then plazas, and now the surface and building facades. I keep finding new and interesting aspects of the city I’m compelled to make images about. I don’t know how long the project will last, I don’t see an end date in sight, but will continue working until I’ve exhausted my ideas—or my focus shifts outside the urban landscape. However, I recently bought a house in Chicago, making the city my permanent home, so I don’t foresee that happening anytime soon. Tell us about your most recent solo exhibition, Urban Constructs. 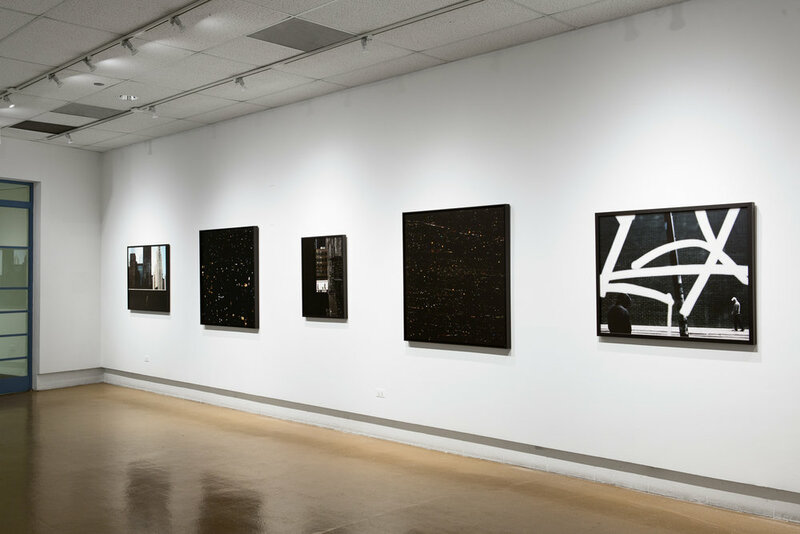 Earlier this year I was awarded an Individual Artist Grant from the City of Chicago’s Department of Cultural Affairs and Special Events (DCASE), and my exhibition Urban Constructs is a result of the grant. It just opened at Northeastern Illinois University’s Fine Arts Gallery. For the show, I’ve put both my City Space and Stray Light projects in conversation with one another to speak to the shift in perception of the urban space from day to night. Rooted in the actions of the pedestrian, Urban Constructs depicts the experience of the urban space in relationship to the physical body by juxtaposing two disparate and ongoing bodies of work, City Space and Stray Light. In the bright light of day, the city’s surface is on display. Buildings appear as solid and impenetrable structures, large swaths of concrete dominate the space, and anonymous individuals fill the streets. The images in City Space speak to the physical environment of the city and its emotional and psychological impact on the body. I use the city as a stage and transform the physical space into a psychological one. These photographs reconstruct mundane events in the city that I have personally experienced or witnessed in public. Similar to a street photographer, I wander the streets for hours, observing life, making snapshots, taking note of people, locations, and lighting; these become the foundation for my work. Stark light, deep shadow and muted color are visual strategies I explore to describe the city. As night falls, this once solid facade of the city fades away. The impenetrable structures appear vulnerable, offering a glimpse of the contents inside. Light emanating from the windows speaks to the individuals who reside inside, acting as a marker of their presence in the physical space. Carefully constructing each image from multiple photographs, I reform the urban landscape in my own vision—one that seeks to reconstruct the heavens in its absence above the cityscape. Light emanating from each window references a world unknown, evoking a sense of mystery and awe. Visually very different, both projects speak to my perception and experience of the urban environment and those who reside within it. Light is used as a tool to transform the urban landscape, imaging it anew, whether in the natural light of day or the incandescent light that fills the night sky. Below are the details of the show and programming that accompanies it. * This project is partially supported by an Individual Artist Program Grant from the City of Chicago Department of Cultural Affairs & Special Events, as well as a grant from the Illinois Arts Council Agency, a state agency through federal funds provided by the National Endowment for the Arts. My process is very much rooted in the act of the pedestrian. I like to roam the city for hours at a time, experiencing and thinking about the city. I try to make room in my schedule to do this at least once a week, if not more. These wanderings provide inspiration and serve as the foundation for my work. In the summer, when the weather is at its best, I often push a lot of my other tasks aside for later—scanning, editing, or professional practice stuff—so I can be outside and on foot. I so much enjoy my time roaming the city and am always looking for new, undiscovered locations or surfaces. The city’s structure and form are not stable; a city is ever-changing and shifting. I can revisit the same spot for years and it can look very different depending on the time of day, year, or man-made alterations, like graffiti, demolition, or construction. I find it fascinating that so many of the locations where my City Space images were made no long exist as they did when I made the photograph, making it impossible to recreate the image. Eventually, I would like to make my City Space project into a book, but don’t feel it’s quite ready yet. I’ll likely keep working on it for a few more years before taking it in that direction. In the meantime, I’m going to keep pushing the work to see where it will take me next. When I’m not working on my current bodies of work, I like to travel with my husband in our VW camper van. I photograph a lot while on the road. Maybe one day it will turn into a project of its own, and then I’ll have an excuse to travel even more. Daniel Rich, Mona Breede, Natalie Krick, Lauren Marsolier, Elizabeth Bick.